Hello people, remember the post where I said I was searching for the perfect hair gel for my twists and twistouts, something that would suit my hair texture, and styles? Many people came through for me, and someone recommended Eco Styler gel, though I never took serious notice of it till months later. At a meet up, someone recommended this same Eco Styler, and I decided to try it out. I got to a UK store and bought a medium bucket-size of Worlds of Curls curl activator gel, and Ecostyler gel because a lot of naturals like the both of them. Even though they are big, I knew it wouldn’t last me a lifetime till my next trip, because I am always on twists, thereby regularly having to use gel. Left to me, I would have bought so much more, if I had enough baggage allowance to carry them. 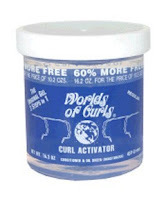 They are both very affordable, but Worlds of Curls Curl Activator Gel is slightly more expensive per volume (at least where I bought them from). Tip: Stay away from amazon.co.uk when purchasing your gels in the UK. They are like four times more expensive there. Get them from those Hair shops all around. You will get a big bucket of almost a litre for about 3 pounds or less. When my hair dries, there’s oil on it, and it shines more. When my hair dries, it dries for real. I feel no oily residue. 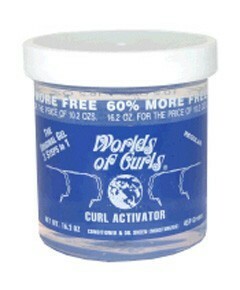 Worlds of Curls curl activator shrinks my hair to about 50 per cent less, after twisting with it. Eco Styler makes my hair shrink more, after twisting with it. I lose about 75 per cent of my hair length when I use it (a whole lot, right?). My hair really looks short after this. Because of the less shrinkage mentioned above, Worlds of Curls gave me less curl definition. Because of the more shrinkage mentioned above, Eco Styler gave me better curl definition. Because of the less curl definition, when I use Worlds of Curls, my twists frizzes sooner (about a day later), gets rough soon, and starts loosing after about six days, which makes me have to loose the whole thing or retwist. Because of the fantastic curl definition, when I use Eco Styler, my twists last for more than 2 weeks, though I usually take it out after about 2 weeks, and still end up rocking a beautiful and definitive twistout after. So that’s it. For me, the only down side for Eco Styler is the massive shrinkage I get when I use it for my twists. It gets better when it’s a twistout as the shrinkage reduces to about 50 per cent. But I would choose Eco Styler over Worlds of Curls any day, any time. It is also better for twist outs (because of the better curl definition). So if rocking a twistout is your reason for twisting in the first place, I recommend Eco Styler. And this therefore ends my search for the perfect Natural Hair gel. No more search, I am sticking with Eco Styler. If I find something better than Eco Styler (not that I would be looking for any), I would be sure to update you. Disclaimer: I was in no way sponsored or contacted by anyone to do this review. I just did it to let people know about my experience, and to update my readers, since I have mentioned having issues with finding a good gel for my hair. P.S: In the meantime, don’t forget to enter for the chance to win one of our giveaway prizes in our African Naturalistas 10-Mega giveaway, if you haven’t already done that. Shea butter would never twist my hair. My hair has a mind of its own. I need a curl pudding or gel to make it stay twisted. Yea, you can give it a try. It doesn't keep my hair twisted, but it might work for you. 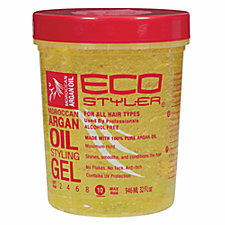 anyone used the ecostyler argan for a wash and go? although i am not a big wash and go person, bu ti have been thinking about it. Thanks so much! I also just discovered this naija girl's channel and she used it for a wash and go. I think I will wait till i attain more length before trying. You can get it in the local Hair products shops. I like using eco styler in the green jar for my twa. But, when I wear twist I use mango and lime twist gel (open container to make sure it is the yellow gel) and I can wear it about 3 weeks and rock a mean twist out for a few days after the takedown. Eco Styler Gel does not work well for my hair type which is very wavy in the front and middle and curly in the back. I love how worlds of curls gave my hair more definition without and crunch with lots of shine. Eco gel made my hair hard and crunchy.